Salary generation, which will differ in each company, but has become a part of almost every implementation. Let’s dive in and hire a new employee, and to do that we will need to follow a five-step process. 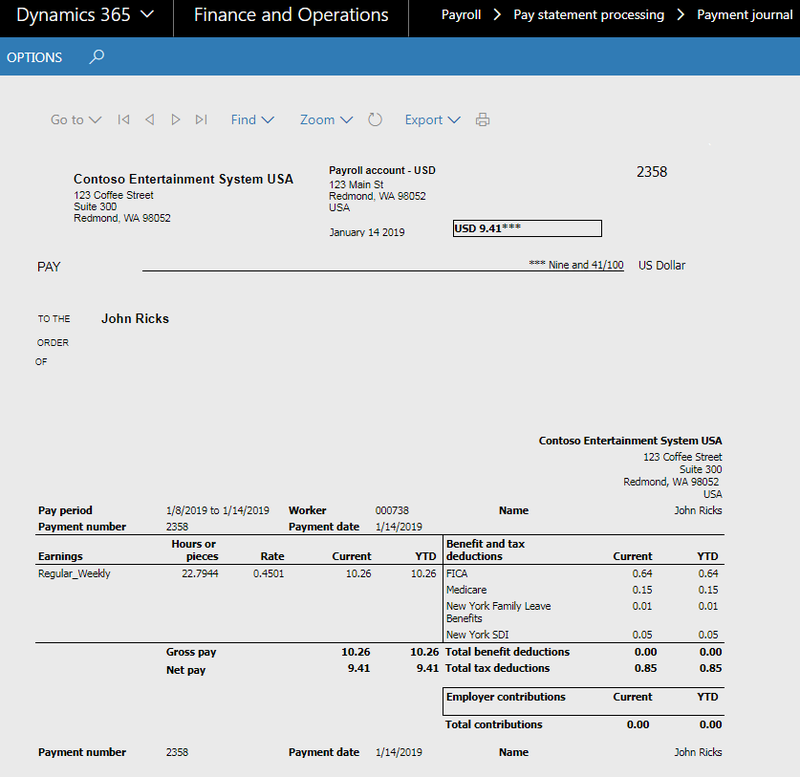 Imagine that your company has a job – let’s say “Accounts payable controller”. What will be the job, title, and position in this case? Commonly, job is a list of responsibilities, competencies and tasks required to perform the job. In this case, job will be “Accounts payable controller”. Job must have a title. So, think of a title as a job title. In our case, title might be AP Controller, Controller, Accounts payable controller etc. For each job, you can have one or many positions. 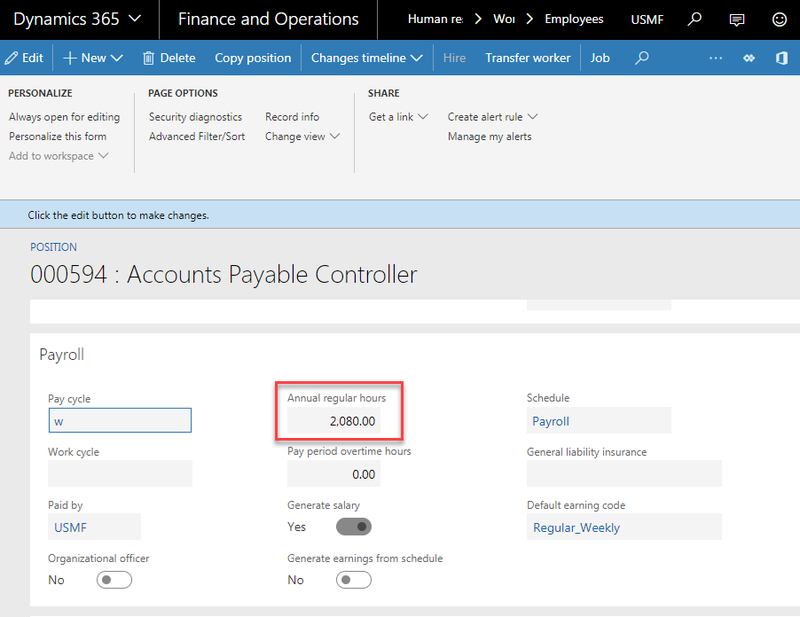 For instance, you would like to have Accounts payable controller per each department in your company or one Accounts payable controller per region. The more people you have for this job, the more positions you will have. Click the New button. Once you open the form, you will see the list of titles available in your company. Provide the title in the Title field. 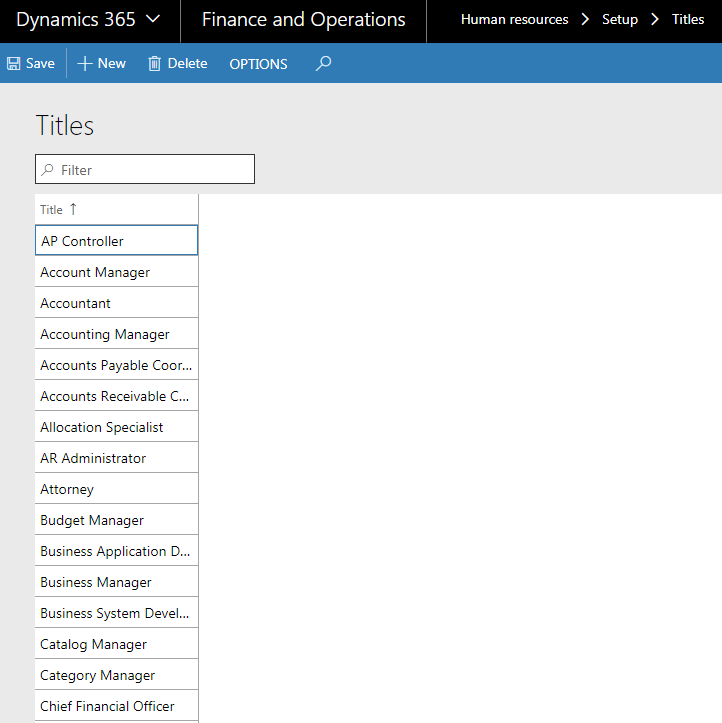 Later on, you can select any of these titles when you create a job. Provide the Job and Job Description. Select the Title for the created job. Select the Job and Department. 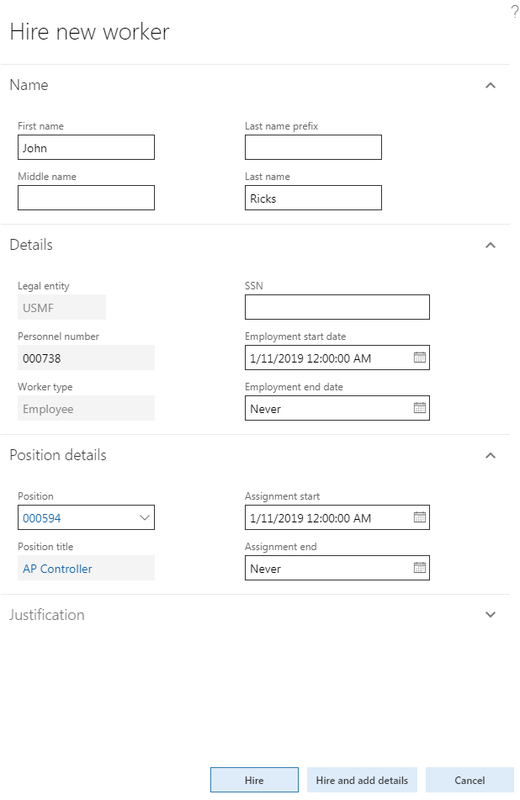 Later on, you can assign only one worker to the created position. If you hire additional recourse for the same position, you will need to create a new position. Pay attention to the title. Title will be inherited from the Job assigned to the position. Select Pay cycle – weekly. Select Paid by and Annual hours. Make sure that Generate salary flag is marked. Select Default earning code with Hourly rate basis. Earning code will define the type of earning that worker receives. For our particular case, we will calculate regular salary. Select the Schedule – Normal working schedule (working days and hours). Provide First name and Last name. Select created position in the Position field. Specify the Assignment start date. 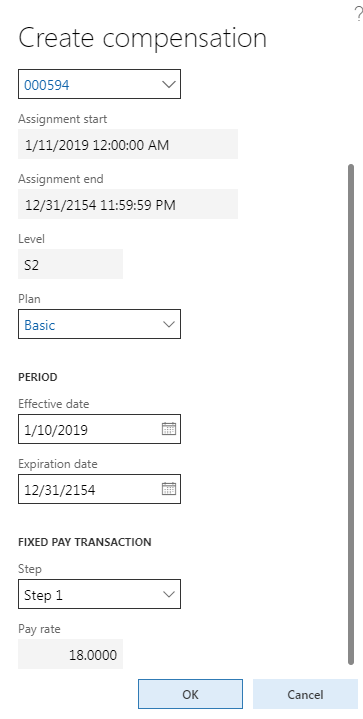 Keep in mind that the assignment start date must be later than or equal to the activation date of the Position. Provide Plan name, Description, Type, Currency, Pay rate conversions. In our case, we will be using 52 working weeks for our employees. 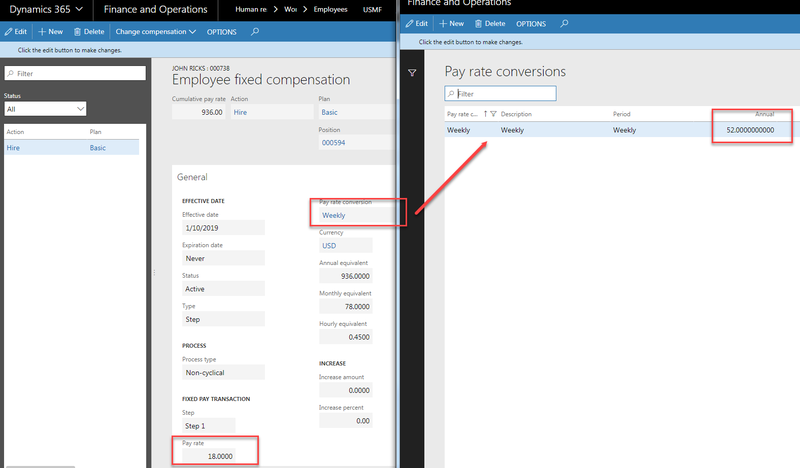 These pay rate conversions will be used to calculate the different pay rates shown on an employee’s fixed compensation plan. 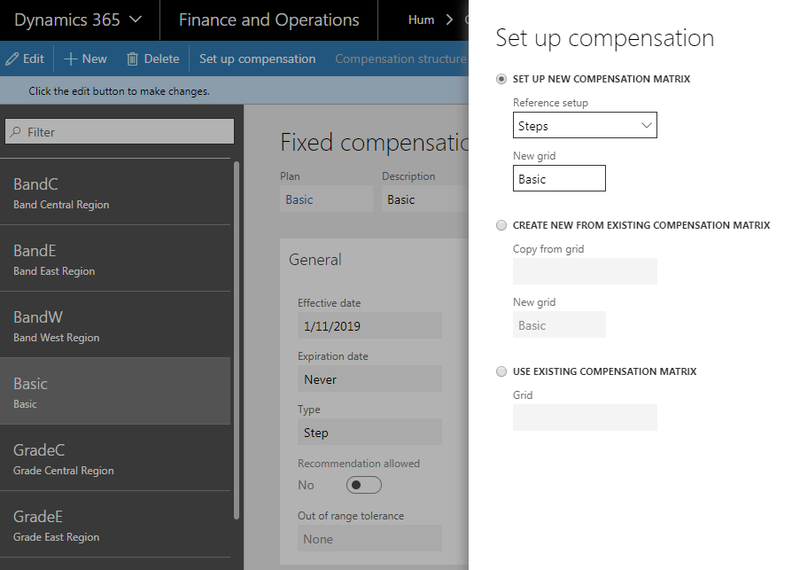 Save the plan and click Set up compensation button. Fill in Reference setup field. Click Compensation structure button (Initially it was called Compensation grid). Create the structure of your rates. 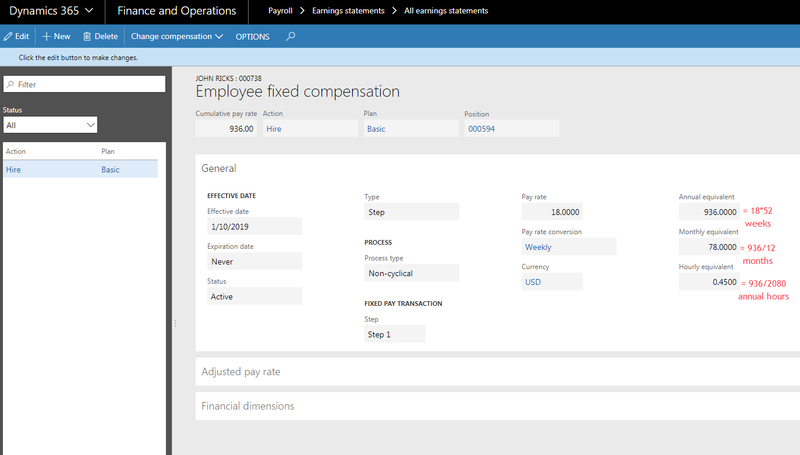 Open worker details form and switch to the Compensation tab. Select Hire action and select created position. In the Plan field, select the created plan. Basic plan that we created is invisible since Eligibility rules were not set up. Let’s navigate to the Human resources > Compensation > Eligibility > Eligibility rules. Eligibility rules need to be assigned to each plan. Eligibility rules determine the eligible employees based on the jobs, job functions, job types, departments, labor unions or compensation regions/locations. Create new rule by clicking New button. Specify the Plan, and Job. 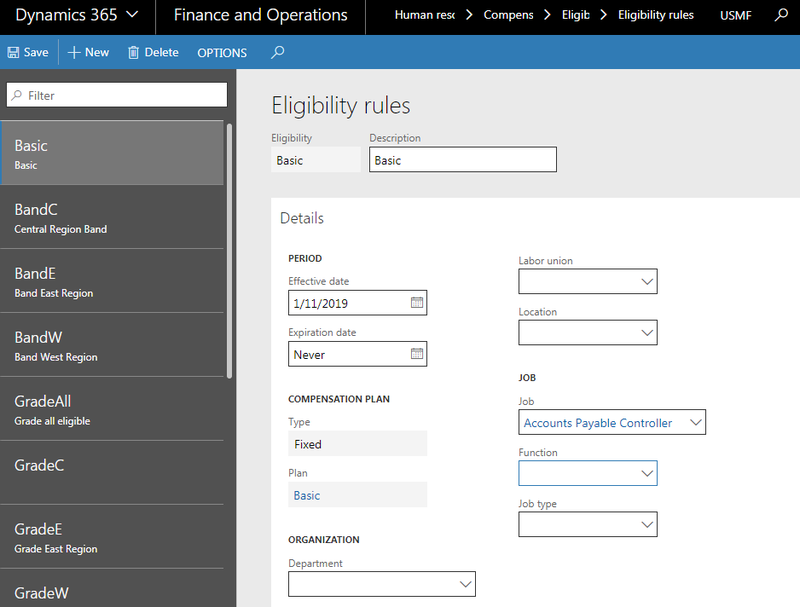 Now, if you go back to the employee compensation plan, you will be able to select the created plan. After plan selection, choose the Step. The reason why Step is not displayed here, it’s because the Step was not assigned to the Job of the employee. Let’s switch to the Job form and populate the Level. Go back, and now it should be possible to select the rate. 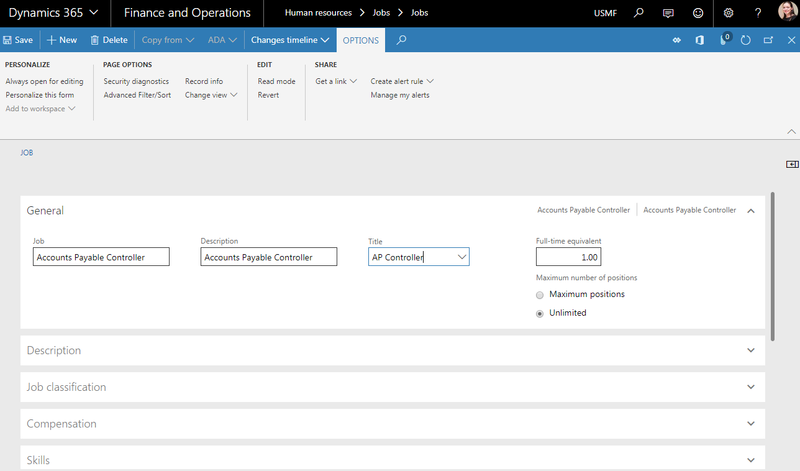 Pay rate will be automatically displayed after Reference point selection. Click OK button and close the form. 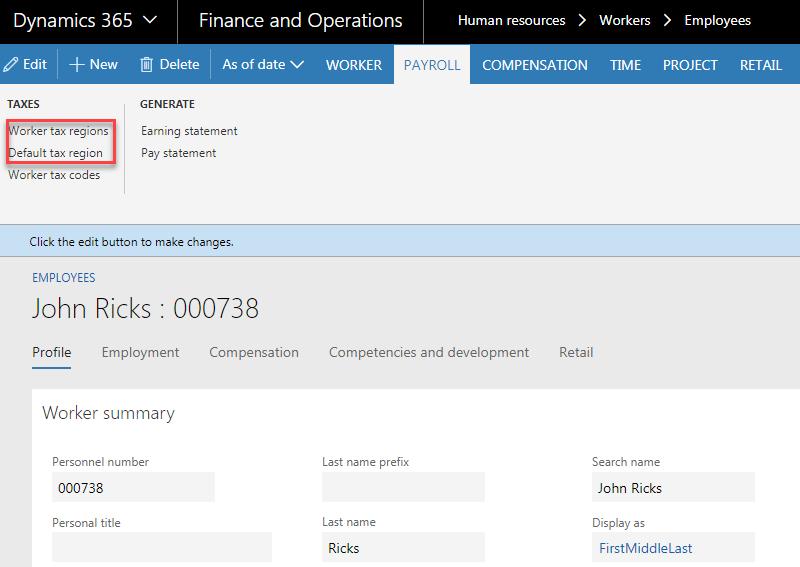 On the Employees from, click Payroll tab on the Action pane. Select Worker tax region button. 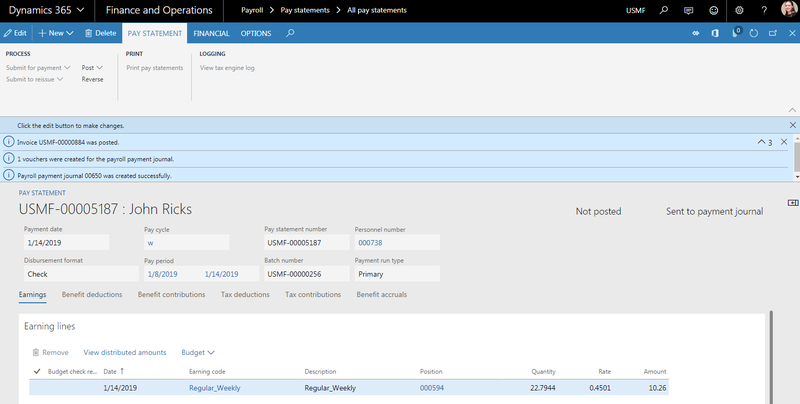 Click the New button and select Tax region from the drop-down list. Select Default tax region button. Make sure that Default tax region is selected. Earning statement will provide information about how many hours employee worked. There are 2 options how you can create Earning statement. Now let’s stop for a second and I will describe how this rate was calculated. 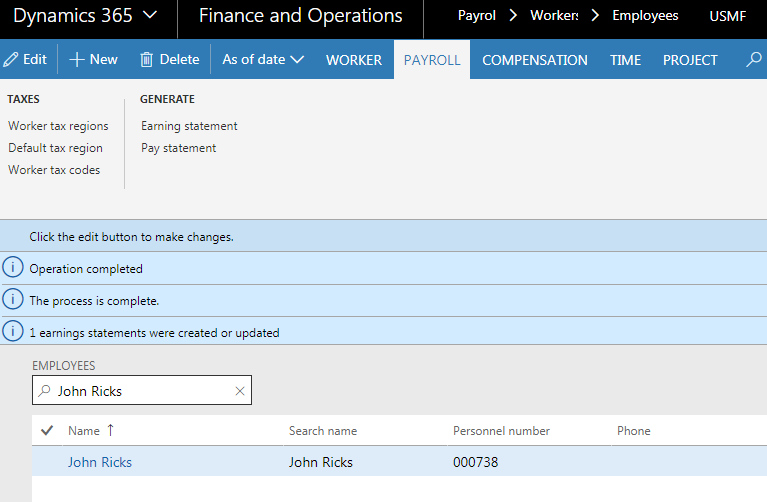 Click Payroll tab on the Action pane. 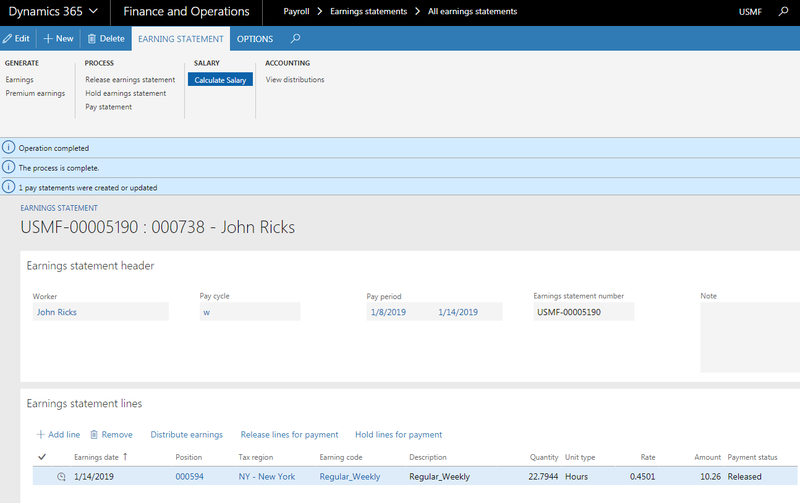 Select Pay cycle, Pay period and click OK.
You will see the message that earning statement was created. 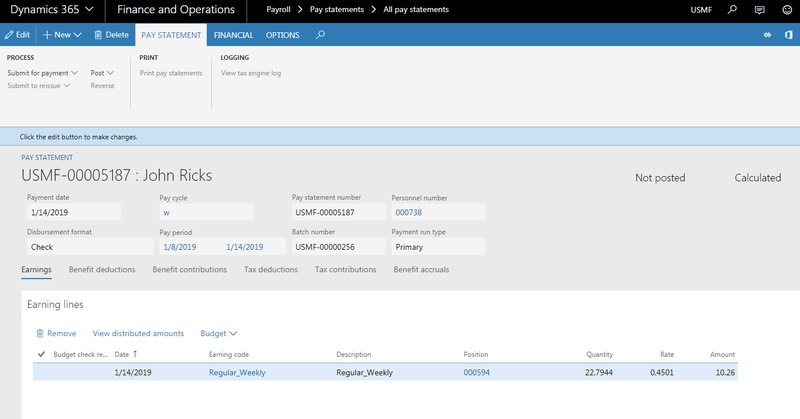 Navigate to All earning statements, find the created one. Now let’s stop for a second and I will describe how this quantity was calculated. Since we have weekly pay period and we selected the following pay period 1/8/2019-1/14/2019, let’s calculate how many days from this he actually worked. We hired our worker 1/11/2019. Form 1/11/2019 till 1/14/2019 it’s only 4 days. Quantity = (2080/365)*4 = 22.7945 hours. Click Release earning statement button. Keep in mind that in order to proceed with releasing of the earning statement, accounting setup must be completed. In our case, Salaries and Wages expense account has been selected. Payment status will be changed to Released. 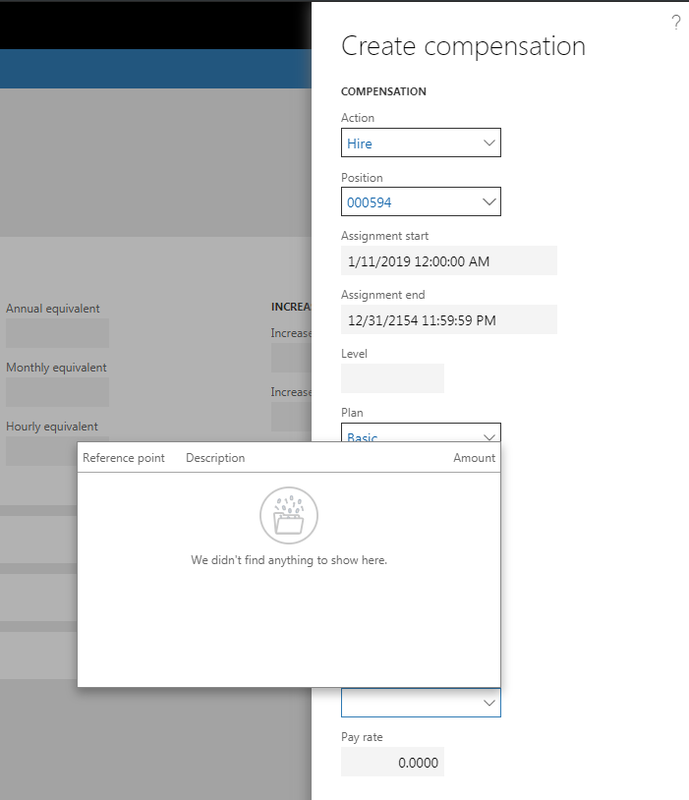 Click Pay statement button on the Action pane after refreshing the form. On the Generate pay statement form, chose the payment date and click OK. Message that pay statement was generated would appear. 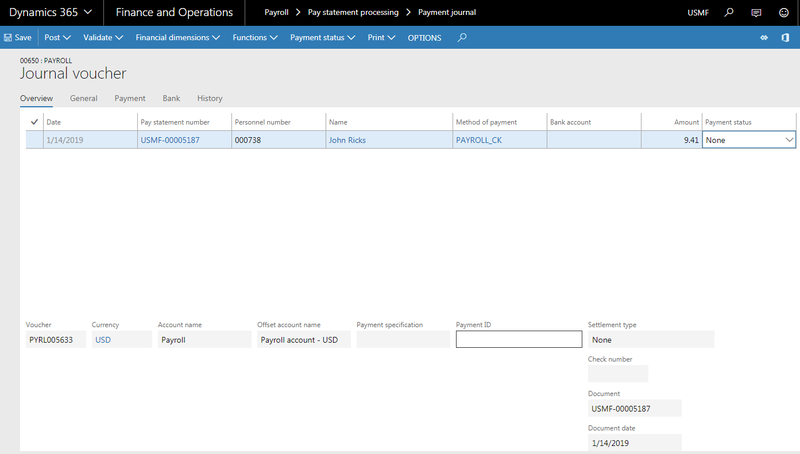 Open the Detail form of the created pay statement. Message that payment journal was created would appear. Find recently created journal and click Lines button. You will notice that Amount = Salary amount – Deducted taxes. 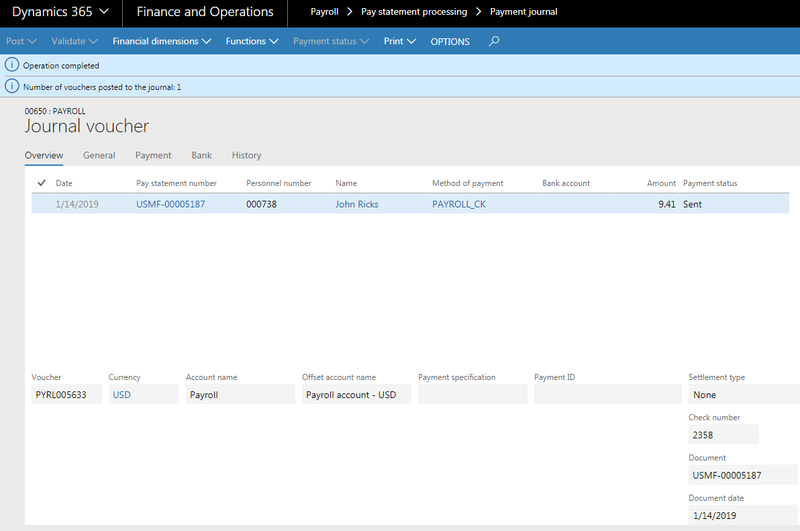 Click Functions -> Generate payments button. 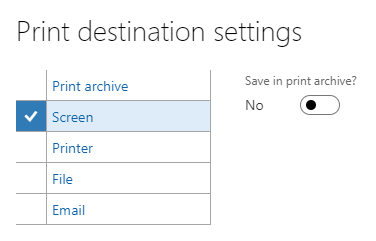 Click Document link and instead of Printer, select the Screen. Status has been set to Sent. Go ahead and Post the journal by clicking the Post button. Message that journal was posted would appear.